It is difficult to begin thinking about summer when we’ve spent most of January battling cold, snow, and ice. For families of teens and young adults, however, summer is right around the corner. Summer programs are often hard to find, registrations are due early, and they tend to fill-up extremely fast. The St. Louis Arc encourages families to start their summer planning process early. Summer Recreation Programs, the first Family Workshop being offered this spring allows families to identify their options this summer. 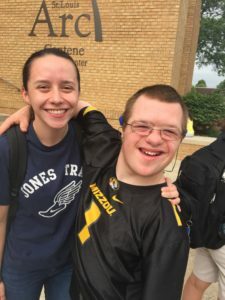 On Thursday, February 7, St. Louis Arc Leisure Services staff along with the Recreation Council of Greater St. Louis will share popular summer options for teens and young adults with disabilities. Families will get essential information about registration deadlines, various program goals, as well as the opportunity to discuss what will be the right opportunity for your child. This workshop is free but does require advanced RSVP to Brianne Smith, Information Coordinator of Family Support, at 314-817-2216. The spring Family Workshop Series offers more than a dozen free workshops. With a wide range of topics for various age groups, the Workshop Series offers both new and repeat sessions. Learn more about upcoming workshops or download the Spring Family Workshop Series brochure.